The practice of loving-kindness, or metta/maitri (Pali/Sanskrit for love or kindness), meditation is a meditation practice which has been passed down since the time of the Buddha over 2500 years ago. Loving-kindness meditation, or “LKM” for short, is about opening up the heart and cultivating love and compassion for ourselves and others. It’s unfortunate because the way most of us live our lives we’re constantly striving to serve ourselves. We’re trying to find peace and happiness and we believe that by living to fulfill our own wishes and desires that we’ll accomplish that. Love all beings. Treat them as you would treat yourself. The problem for so many people is very few traditions that exist in the world actually give practical ways to do this. In most traditions, words are spoken, but true insight and the consequent instruction on how to cultivate love for all beings is missing, even though the truth and wisdom are there in statements. But if we look to Buddhist wisdom we see an unbroken lineage of practitioners, from the Buddha all the way to the present-day Dalai Lama, who have used loving-kindness meditation to transform their mind, open up their heart, and realize the true way- that the path to happiness is through selflessness. To be clear, this doesn’t mean that you ignore yourself. In fact, it’s quite the opposite. You’ll see in the instructions below that the very first thing you do in loving-kindness meditation is work on cultivating love for yourself. This is because it’s through working on ourselves that we’re able to serve others. If we ignore our own well-being, our own peace and happiness, we’re no good to anyone. When we nurture our mind we become a limitless beacon of light for others to feed off of, and in this way, our peace and happiness helps others find peace and happiness as well. The practice of loving-kindness meditation (or LKM) is very easy to do, and can and should be modified based on your preferences. The general idea behind LKM is that you’re sending well-wishes, or positive thoughts, to yourself and others. Picture beautiful imagery to instill a sense of love and peace within you. Chant simple phrases, like the mantra I listed above. Or simply say the mantra to yourself in your mind. The general advice for beginning practice is to focus on each person for 3-5 minutes and generating love for them before transferring it and moving on to the next person. If you do this, the meditation will take just 15-20~ minutes. Sending love to yourself may feel awkward. If sending love to yourself feels awkward, don’t worry, you’re not alone. This is natural and you may experience it. If that’s the case, you can switch the First Stage and Second Stage so that you’re first cultivating love for a respected/caring (highest level) person and then sending those feelings to yourself, a close family member or friend, someone neutral, and then someone you dislike. This is an effective way to practice in the beginning if you’re having trouble with this. You may not have a person to fulfill every stage. If that’s the case, it’s perfectly fine. There are only a few hard rules with this meditation, and having someone for each stage isn’t one of them. If you can’t particularly think of someone you dislike, think of someone who has annoyed you in the past and cultivate love for them, or skip the step so long as you have no one you can think of to fulfill the stage. Practice makes perfect. Not perfect with regards to your skill level, but perfect with regards to your comfort level and the effectiveness of the meditation for you. Try out picturing imagery, chanting, and repeating to yourself to see what works better for you. Also try different mantras, mix in wording that compels feelings of love from you, and try different imagery if you’re going that route. 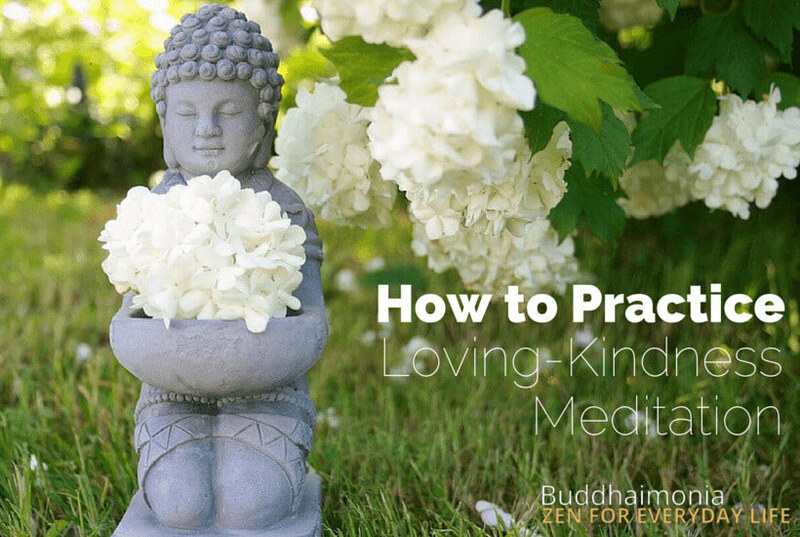 Loving-kindness meditation can also be a very effective “everyday” practice as well for overcoming difficult daily challenges (you can read more about that here). I hope this simple guide to loving-kindness meditation has been beneficial to you. There are many different kinds of meditation and this has proven a very effective method for many people. Try it out and see how it works for you.